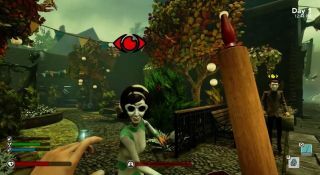 We Happy Few is is "a drug-fueled alt-60s dystopian nightmare," as we described it yesterday, "in which you take your happy pills or you get your face bashed in." Based on that alone, it's a game I want to play, and given the success so far of the recently-launched Kickstarter, I'm not alone in that. But how does it play? Explaining that part of it is tricky, as you might imagine, so Compulsion Games has posted a video of 15 minutes of pre-alpha gameplay to help clear things up. Because the game is still in a very pre-release state, bugs and placeholder assets do occasionally pop up. Even so, the video makes it a lot easier to grasp the basics of gameplay: looting, crafting, fighting, dying, and starting over in a new environment, with much of your experience determined by the luck of the draw. Later on in the trailer, narrator Joshua Mills demonstrates the impact of taking Joy, the drug that makes everyone happy: It satisfies those around you that you're one of them, but it takes a serious toll when it wears off. The We Happy Few Kickstarter got underway yesterday, and so far it seems to be going swimmingly: In just one day, it's notched up more than $68,000 on a $250,000 goal. It runs until July 4.